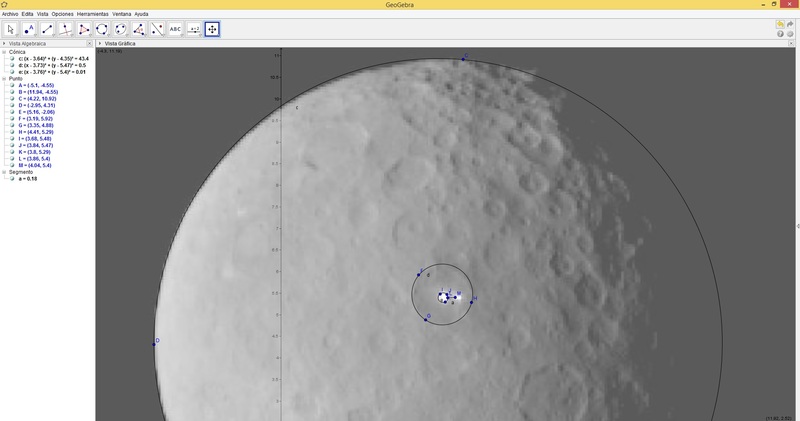 Our first look at a dwarf planet! I wonder what the white spots are. Their sharp contrast with their surroundings reminds me a little of the monolith on Iapetus in 2001: A Space Odyssey (the book, not the film). Agh! That is so cool! Recently I wrote a short essay (only a page long) on the recent Dawn happenings for civics class and I've been excited for the mission ever since. This is awesome stuff! Yeah I can't wait until we finally get to see what it looks like from up-close Too bad New Horizons won't land on it though. It would be awesome if that high albedo area is a massive exposed ice field! Does it actually looks gray or it's just because of the Dawn's camera? I think is quite plausible. Maybe the impact that created that crater reached the subsurface ocean and the water freezed while exposed to the vacum of space, making a mirror in the base of the crater. I want to see what it is!!! Since we are aproaching Ceres from the inner solar system, we have only seen the day-side of the dwarf planet, but immagine that this week watching the other side we discover that the spot is also bright at night!! that woould be terrifying xD and would make the reflection hypothesis erroneus. Immagine that the spot is shinning because of his own emission. It would be awesome (as everything probably). Maybe with this rought measurements we can set the stage for our imagination. Are photos taked in color or in black and white? Because that spot could be a volcano or something like that! Niako, given the size of the body, it can't have active volcanoes. To explain it, just think that as a body is smaller, it cools faster (unless it is heated by a massive neighbor's gravity, like Io and Jupiter). Mars for example, is practically frozen while Earth still keeps it heat and volcano activity. 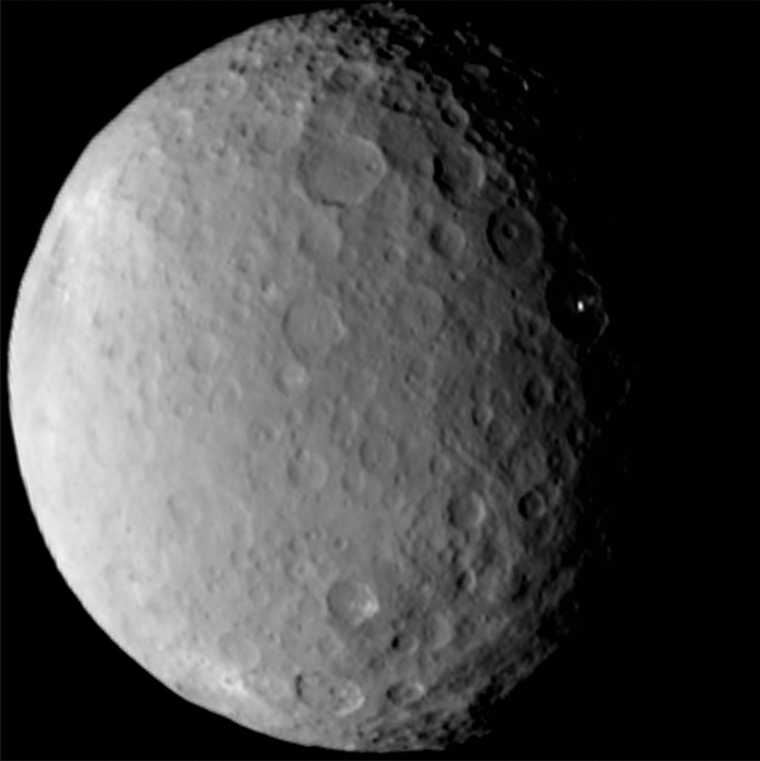 Ceres is completely alone, so it is frozen and have no volcanoes. Therefore, the explanation must be a lot more interesting! the bright spot appears to be like 14,5 km in size (like a big city), but I think that the size is just an illusion due to the brighness of the location. Yes it is much smaller in reality. On this image it is overexposed. Look at more older images from Dawn. Niako, given the size of the body, it can't have active volcanoes. It could have a cryovolcanoes. Water vapour emission from Ceres was detected a year ago. Dang, I was really hoping. More seriously, I wonder if studying how its brightness changes as a function of phase angle, relative to the surroundings, would be helpful in determining what substance it is. I'd suspect it would be different for ice than for light-colored rocky material. hahahah. Well at least now we know it's from reflexion that the spot shines. Since it doesn't change to much at different angles I think this has to be a complex surface with many contortions so that it reflects light equally in all directions. At the planet's terminator it shines amazingly!!! even at twilight it looks like a lighthouse so this have to be a very reflective surface. If the bright spot shows overexposure to the camera then we can't determine the brightness of the surface until we resolve the dimensions of that small region right? So if the size of the shining area gets smaller, that means that it's brighter. How bright is by now, considering that it measures at max 14 km?